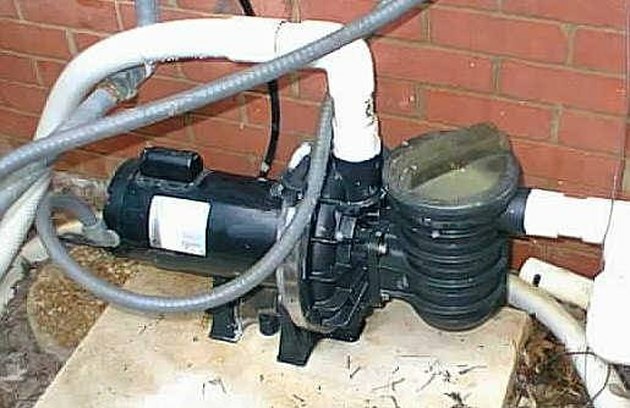 There are many reasons why the pump isn't moving water. There may be an air pocket stuck in the pump, preventing water from passing through. If this is the case then the pump should be opened and water poured in by hand. The filter could be clogged, preventing water from passing through it. In this case the filter simply needs to be cleaned. The impeller blade of the pump could be broken, meaning the motor is running, but not actually moving anything. The transparent canister through which water flows in and out of the pump should be observed. If water is present, but not moving, then the impeller is broken and the entire pump must be replaced. The intake or output pipes could be blocked by debris. This is difficult to prove given how far the pipes travel, thus one should assume it is the problem once all other possibilities have been exhausted. A plumber or pool service and repair service can run flexible tubing through the pipes to clear the blockage. The pump contains a cooling fan which is designed to keep the electric workings cool. This is noisy and there's little that can be done about it seeing as it must be running to keep the pump from overheating. There are other causes for the noise though. The sound would be magnified if the pump were vibrating against its concrete base. A rubber mat slid underneath the pump should make a decent baffle. The bearings in the motor could be worn, which happens normally after several years of use. This can be exacerbated if one has fed an excessive amount of chemical tablets to the skimmer as they would've eaten away at the bearings, causing premature wear. If this is the case the bearings must be replaced by a certified repair shop. There are several possible reasons for this. The pump could be wired to the incorrect voltage. Pumps can either be wired to 115 volts or 230 volts, based on the voltage commonly used in that country. This can only be verified and correct by an electrician. The pump might also be overheating if the internal fan has broken. If you were to press your hand against the side of the pump, it would be painfully hot. In this case the pump should be disconnected and taken to a repair shop to verify the problem and fix it.